IRELAND UNDERAGE INTERNATIONAL defender Oisin McEntee made his Newcastle U23 debut one to remember last night with a goal as his side came from behind to beat West Brom 4-2. It was a manic Premier League 2 game at Whitley Park as the Cavan man made it 2-1 from close range just before half time. Prior to that, West Brom had opened the scoring and the young Magpies levelled through an own goal. In the 54th minute, Newcastle went 3-1 up before West Brom substitute Jamie Soule soon had one goal separating the sides once again. But Yannick Touré sealed the deal with 76 minutes on the clock, leaving it 4-2 to the Magpies. 18-year-old McEntee was born in New York but moved back to Cavan with his family at a young age, playing with local clubs before making the switch to Dublin where he lined out with Belvedere and Malahide United. Also a talented Gaelic footballer, McEntee has powered through the Irish youth ranks while working his way through the underage set-up at Newcastle. 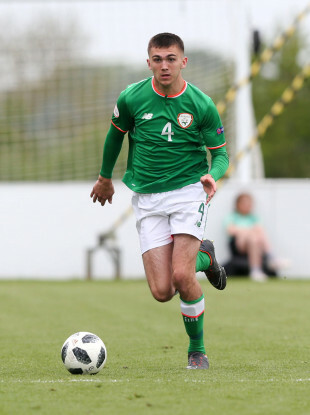 In 2018, he played every minute for the club’s U18s, and was a central part of that Ireland U17 team that suffered a cruel Euros exit last May. The Boys In Green were controversially beaten 5-4 on penalties by the Netherlands with goalkeeper Jimmy Corcoran given his marching orders — a second yellow — for leaving his line before saving an effort. McEntee took over between the sticks then, but Holland prevailed. He was included in the Ireland U19 squad last September for friendlies against Wales. Email “18-year-old Cavan defender impresses and fires home on Newcastle U23 debut”. Feedback on “18-year-old Cavan defender impresses and fires home on Newcastle U23 debut”.